The 27th annual Centenary Book Bazaar will be held Friday, September 6, from 4:00-9:00 p.m., and Saturday, September 7, 9:00 a.m.-4:00 p.m. in the Gold Dome. During the two-day Book Bazaar, the Gold Dome becomes the largest bookseller in the state of Louisiana. 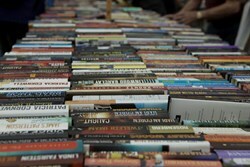 The 27th annual Centenary Book Bazaar will be held Friday, September 6, from 4:00-9:00 p.m., and Saturday, September 7, 9:00 a.m.-4:00 p.m. in the Gold Dome. The Book Bazaar is organized and sponsored by the Muses, a philanthropic group dedicated to funding projects and programs for Centenary College of Louisiana students. "During the two-day Book Bazaar, the Gold Dome becomes the largest bookseller in the state of Louisiana," said David Williams, Associate Manager of Advancement Services and liaison to the Muses. "The ladies of the Muses are what make this event so successful because of their year-round hard work and dedication. They volunteer their time and energy so that all of the money raised goes directly to fund projects benefitting Centenary students, faculty, and staff." Patrons should bring bags or boxes to carry out their books. Carryout assistance is available. Cash or check is accepted. On Saturday, all items become half-priced after 12:30 p.m.